There is a lot of exposure in this production. There is no curtain for a start, no flats, no scene painting, nothing obviously comfortable on stage but utility furniture. 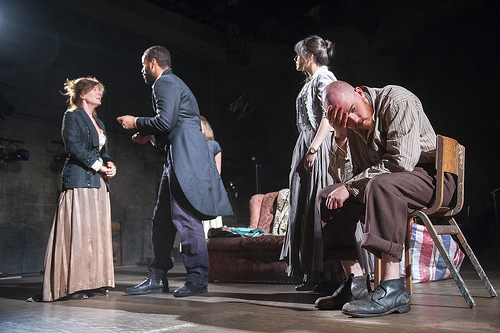 Across the back, exposed, is a dressing room, liquor bottles and music kit, for the (a)ttiring house of the Shakespearian theatre equips this new adaptation of Dostoyevsky’s unsettling Crime and Punishment. The company gathers, warming up, as the audience sits down and a full-on Psalm 130, De Profundis, ‘Out of the depths … hear [our] prayer’, shifts seeming rehearsal to actual performance. What you are about to see could be barefaced and brazen. In fact the way to enjoy this co-production with Glasgow’s Citizens and Liverpool’s Playhouse is to look at it as an amateur photographer and to accept that fiddling with your dramatic settings will affect what you see. Some scenes will be sharp, others appreciably less so; some clearly sequenced, others vaguely. The programme casts this as ‘fluidity of the staging, with its seamless transitions’. Depth of field, then, is key. Rodion Raskolnikov, the ur-student transgressor, is more in focus than out of it, which is to actor Adam Best’s credit as the character is in the fever grip of irresolution to the point of passing out on his sofa or remaining mute and motionless while a policeman snuggles onto him and licks his shaven head. Raskolnikov’s idea of responding to the love-of-his-life, Sonya, is to bow down before her unhappiness. He is fixated on the genius of Napoleon but has the strategic nouse of a double axe-murderer. Best is lucid and good at the verbal and facial tics that impede Raskolnikov’s nihilistic raptures. Adjust for comic relief and enter George Costigan first as Marmeladov, drunk, and then as Porfiry Petrovich, detective and examining magistrate. Now we’re learning about portrait photography: the two subjects are nicely observed, properly defined, and hold your attention. However, the entertaining, disconcerting, scenes might as well be framed: Meet a Drunk, Cross-examination, Youdunnit – as they illustrate what happens when police procedural meets comic accent and turn. Costigan’s Petrovich proves a wry nemesis. Cate Hamer’s two principal roles as Pulkeria, Raskolnikov’s mother, and as Katerina, Marmeladov’s wife, are demanding and prominent but they cannot provide humour. Hamer has to do destitution, torn affections, and mental breakdown in vignettes of scenes where there are no decorative borders. The effect is monochrome. There is a lot of creative energy and skill expended in this production. Supporting parts are bright and live in the moment, notably Obioma Ugoala as the unselfish Razumikhin. Writer, Chris Hannan, knows his Dostoyevsky and pares the novel down with evident respect and sensitivity. Thematically it is pretty intact, not least its all-Russian face-off between social cataclysm and (Christian) redemption, between the polemic of ‘new ideas, new economics’, and Sonya’s New Testament. Raskolnikov is criminally self-absorbed and the play’s script interrogates him. Stage microphones amplify his breathing; other characters ‘resting’ back-of-stage also judge him. Domininc Hill’s direction is clever – a door on wheels makes for fast entrances and exits, digitised blood slashes red and the soundscape is close to a Threekopek Opera – but finally, inevitably maybe, in this busy play-novel of downed vodka and photographic ‘shots’, I found that the drama has the consistency of one of Luzhin’s caramel wafers.